Are take-home naloxone programmes effective? Systematic review utilizing application of the Bradford Hill criteria. Addiction: 2016, 111, p. 1177–1187. How confident can we be that take-home naloxone programmes are effective without the ‘gold standard’ randomised trial? Judged against nine criteria for establishing the presumption of causality, evidence that the provision of naloxone reduces overdose-related deaths among opioid users. Summary Opioid overdose is a major cause of premature death, and accounts for the majority of deaths among people who inject drugs worldwide. However, deaths are preventable with the timely administration of the overdose antidote, naloxone. The featured review assessed the impact of take-home naloxone programmes using the nine Bradford Hill criteria – a well-established method for establishing the likelihood of a ‘cause and effect’ relationship between an intervention and an outcome where it is not possible to allocate participants at random to an intervention versus a comparator. This method demonstrated that provision of the overdose antidote naloxone to people who are not healthcare workers is likely to be an effective way of preventing overdose-related deaths. Take-home naloxone has led to improved survival rates among programme participants and reduced heroin overdose mortality rates in the community, and is accompanied by only a low rate of adverse events. The aim of the following review was to assess the effectiveness of ‘take-home’ naloxone programmes, which typically involve distributing naloxone-based overdose rescue kits to opioid users, family members and peers, and training them in the risks of overdoses, what to do in an emergency, and how to administer naloxone. The community-based provision of naloxone was first proposed in the 1990s, making it accessible to people other than healthcare workers. Affirming the role of peer interventions in opioid overdoses, in 2014 the World Health Organization recommended that “people likely to witness an opioid overdose should have access to naloxone and be instructed in its administration”. Critics of take-home naloxone programmes have argued that the absence of randomised trials means there is no strong evidence that they reduce overdose deaths. Similar concerns were previously expressed about other harm reduction strategies – including needle exchange programmes and opioid substitution therapy – that are now considered evidence-based practice. The featured paper assessed the safety of take-home naloxone programmes and their impact on overdose-related deaths using the nine ‘Bradford Hill criteria’. This well-established method can help to establish the likelihood of a ‘cause and effect’ relationship between an intervention (in this case, take-home naloxone programmes) and an outcome (in this case, rates of overdose-related deaths) where it is not possible to allocate participants at random to an intervention versus a comparator, for example because it would be impractical or unethical. This was supplemented with an assessment of the feasibility and implementation of take-home naloxone programmes using five additional criteria stated in a World Health Organization “Evidence for Action” report on the effectiveness of needle-exchange interventions in reducing HIV among people who inject drugs. Databases were searched for relevant English-language, peer-reviewed publications. All 22 studies which met the review’s criteria were observations of what happens when a naloxone programme is instigated in an area. In none had the researchers been able to randomly allocate areas or participants to such a programme versus no programme or an alternative one. With so many other possible influences at play, it meant that the studies were unable in themselves to establish that naloxone programmes cause a reduction in overdose deaths – hence the importance of applying the Bradford Hill criteria itemised below to the whole set of studies. Whether there is a strong association between the provision of take-home naloxone and overdose reversals. There was a strong association between take-home naloxone programmes and people surviving overdoses, evidenced in 17 studies by the estimated 2,249 successful overdose reversals among 2,336 administrations of naloxone. Only in one study was this link between the provision of take-home naloxone and overdose reversals not observed; the primary reason for participants not administering the naloxone they had been provided was that they did not have their naloxone supply available. Whether different studies conducted in different locations, in different populations, by different investigators, and at different times reported similar findings. There was substantial support for the consistency criterion. Overdose reversals using take-home naloxone have been documented by independent investigators under different circumstances in at least 15 different cities, states and countries including Canada, the United States, the United Kingdom, and Germany. Whether take-home naloxone has the unique effect of reversing opioid overdoses. Overall, there was strong support for this criterion as take-home naloxone exclusively reverses opioid-induced overdoses. Whether the distribution of take-home naloxone precedes reductions in overdose deaths. Overdose mortality rates were significantly reduced in communities after take-home naloxone was implemented, compared to rates before these programmes and compared to communities without take-home naloxone. In 21 of the 22 studies, training in overdose prevention and take-home naloxone provision preceded overdose reversals. Two of these studies provided clear evidence in support of this criterion. Whether increased take-home naloxone supply goes hand-in-hand with more overdose reversals. There was only limited evidence for a dose-related impact of take-home naloxone availability, so this criterion was only partially fulfilled. Researchers have estimated that take-home naloxone distribution can only achieve maximum impact on overdose deaths if a certain number of take-home naloxone kits are available in the community. Among the 22 studies, only one assessed the impact of varying degrees of take-home naloxone availability on overdose mortality by splitting the 19 participating communities into three groups based on the level of take-home naloxone distribution: zero implementation, low implementation (1–100 people enrolling in the programme per 100,000 residents) and high implementation (more than 100 people enrolling per 100,000 residents). In this particular study there was a significant dose–response relationship, with the greatest effect on rates of overdose death occurring in areas with the greatest level of implementation. Whether it is plausible that a reduction in overdose deaths occurs when take-home naloxone is available. There is strong support for naloxone being a biologically plausible response to overdose. Naloxone works by blocking opioids such as heroin and rapidly reversing the effects of opiate-type drugs, including the respiratory depression which causes overdose. The pharmacological effects of naloxone are associated with the estimated 2,249 overdose reversals documented in the studies. Whether there are documented examples of opioid overdose mortality declining without take-home naloxone availability, and if ‘yes’, whether these conflict with the assumed association between take-home naloxone and the prevention of overdose deaths. Declining overdose rates in the absence of take-home naloxone have been reported in the literature. The Australian heroin drought is a prominent example, where between 2001 and 2002 overdose-related mortality rates dropped in conjunction with a shortage in illicit heroin imports. In this case, take-home naloxone could not have accounted for the decline in mortality as it was only introduced in Australia in 2011. However, this does not conflict with the current understanding of the mechanisms of naloxone during opioid overdose. The 21 studies which reported overdose reversals provide strong support for the coherence criterion. Whether there is evidence to support the hypothesised impact of take-home naloxone on overdose-related deaths. In addition to laboratory studies and randomised trials, natural experiments with before-and-after measures can demonstrate effectiveness in a ‘real-world’ setting. One study using a robust research design found that even communities with low-level implementation of take-home naloxone (1–100 people enrolling in the programme per 100,000 residents) saw a reduction in overdose mortality, compared to communities without take-home naloxone distribution. Therefore even in the absence of experimental studies, there is preliminary support for the experimental evidence criterion. Whether there is a treatment similar to take-home naloxone that leads to an outcome similar to overdose reversal. 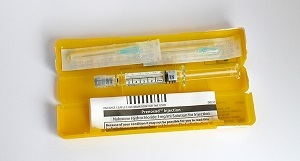 Take-home naloxone has been compared to the provision of adrenaline injection kits for family members to administer in the event of anaphylactic shock, the provision of glucagon for insulin overdose, and the use of defibrillators and training in cardiopulmonary resuscitation (known as ‘CPR’) for lay people likely to witness cardiac arrest. These are examples of comparable emergency interventions, which have demonstrated that timely delivery of the interventions is crucial to their effectiveness. The additional five World Health Organization criteria were all either fully (three) or partially met (two). Cost-effectiveness. Data collected from both the United States and Russia indicates that take-home naloxone is cost-effective even in circumstances where the cost of naloxone increases and relatively few overdoses are witnessed. Absence of negative consequences. Take-home naloxone programmes have a low rate of adverse events. Where adverse reactions have occurred, these are most frequently symptoms of opioid withdrawal including nausea/vomiting, and agitation. Feasibility of implementation, expansion and coverage. Take-home naloxone schemes have been implemented in a wide range of geographical settings and cultures. Outside the 22 studies included in this review, implementation in resource-poor settings was also achieved in Kyrgyzstan and Tajikistan. Unanticipated benefits. Four of the 22 studies reported unanticipated benefits of naloxone provision including decreased drug use three months later, anecdotal evidence of increased willingness to be tested for HIV and hepatitis C, and within a three-month follow-up period, recipients of take-home naloxone training a family member or peer. Special populations. Take-home naloxone provision has been successfully delivered to special populations with a high risk of overdose including patients undergoing withdrawal from drugs, homeless people, methadone patients, and people on release from prison [see Effectiveness Bank entry]. In the absence of randomised trials, the scrutiny of evidence from 22 observational studies using the nine Bradford Hill criteria for inferring cause and effect suggests that the community-based provision of the overdose antidote naloxone is likely to be an effective way of preventing overdose-related deaths. While the evidence was sometimes based on only one or two studies, or criteria only partially fulfilled, there was nonetheless support for all nine criteria. Take-home naloxone has led to improved survival rates among programme participants and reduced heroin overdose mortality rates in the community, with only a low rate of adverse events reported. Standard care for the community-based prevention of heroin overdose deaths should include distributing take-home naloxone to at-risk users. commentary Unable to draw on evidence from randomised trials – considered the ‘gold standard’ in research – this review applied nine criteria to the evidence base to assess how confident we can be that take-home naloxone reduces overdose-related deaths among opioid users. As all nine criteria were satisfied the authors concluded that it was likely the community-based provision of the overdose antidote naloxone is an effective intervention. Of course naloxone can reverse an individual overdose but does providing it widely across an area actually reduce the overall overdose death rate? Naloxone is a drug which rapidly reverses the effects of opiate-type drugs, including the respiratory depression which causes overdose. It became the main new hope for curbing the death rate after in 2005 UK law was amended to permit emergency administration by any member of the public. The drugs naloxone reverses are not the sole cause of overdose deaths – benzodiazepines and alcohol play a big role – but across the UK, opioids contribute in the overwhelming majority of cases (87% of drug poisoning deaths in 2015). • People likely to witness an opioid overdose should have access to naloxone and be instructed in its administration to enable them to use it for the emergency management of suspected opioid overdose. • Naloxone is effective when administered by intravenous, intramuscular, subcutaneous and intranasal routes. Persons administering naloxone should select a route based on the formulation available, their skills in administration, the setting, and the local context. • In cases of suspected opioid overdose, first responders should focus on airway management, assisting ventilation and administering naloxone. • After successful resuscitation following the administration of naloxone, the level of consciousness and breathing of the affected person should be closely observed until they are fully recovered. An Effectiveness Bank hot topic has reviewed issues relating to overdose prevention, and another has focused on naloxone programmes.